On average, American households use about 400 gallons of water each day. About 15 percent of that water is utilized in lawns and gardens. 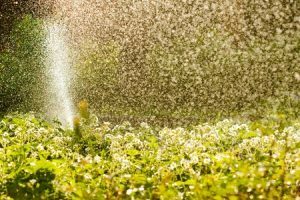 If you want to save money on your water bill while still maintaining your lawn and garden, there are some simple water-saving strategies you start employing today! Install an automated irrigation controller. Modern irrigation controllers offer a host of high-tech features that are designed to save water in your lawn and garden. The Rachio Smart Sprinkler Controller is a particularly popular option that tracks the weather forecast and automates your irrigation schedule so that you never have to worry about over watering your garden. It also allows you take manual control of your irrigation system right from your smartphone. Why use tap water in your garden when you could capture it from the sky? By setting up a rain barrel under one of the downspouts in your home’s gutter system, you can harvest rainwater and reuse it in your lawn and garden. You can also connect it directly to your irrigation system if you have one. Want to cut back on your water consumption and cultivate a low-maintenance garden? Consider planting drought-tolerant species that don’t need a lot of water to thrive. You can even replace grasses with low-maintenance groundcover options to reduce the amount of mowing you have to do as well. Looking for the right tools for your next landscaping project? You can find affordable options from trusted brands like John Deere and Toro right here at Lawrence Tool Rental. Give us a call or contact us online today to get started!